Er, in case you couldn’t discern from the title of this blog, I live in Amsterdam. If you’ve never visited, let me tell you that living space is at a premium. We live in a 55 square metre apartment on the first floor. We have a 4×1.5 metre balcony that (lucky for me) is south-facing. As a Canadian gal, I grew up having a vegetable garden in our yard. It’s so satisfying to grow your own food from seed. This is the fourth year that I’ve had a balcony garden. The weather obviously is the deciding factor on how my plants grow. Last year, it was gorgeous here until August, and then it rained non-stop. The lack of rain and no sun stunted (or ruined) my strawberries, peas, and carrots. The fail-safes (lettuces, tomatoes and herbs) were fine. This year I’ve got: rainbow chard, cascading cherry tomatoes, beets, Asian lettuce mix, raspberries and herbs (cinnamon basil, regular basil, flat-leaf parsley and oregano). Rainbow chard - a good choice for the balcony. I don’t know how or why and I don’t want to question it too much but we’ve had one helluva spring. And by “helluva”, I mean, the entire month of April has been not only sunny, but extreme above-average temperatures for this time of year. Last year in mid-April I was wearing my winter jacket still. This year? It’s been 24-27 degrees. Unbelievable! An herb box, all the seeds on the left stunted. Weird. My fave – the red beet. Fingers crossed on this one. Cascading tomatoes planted from seed. 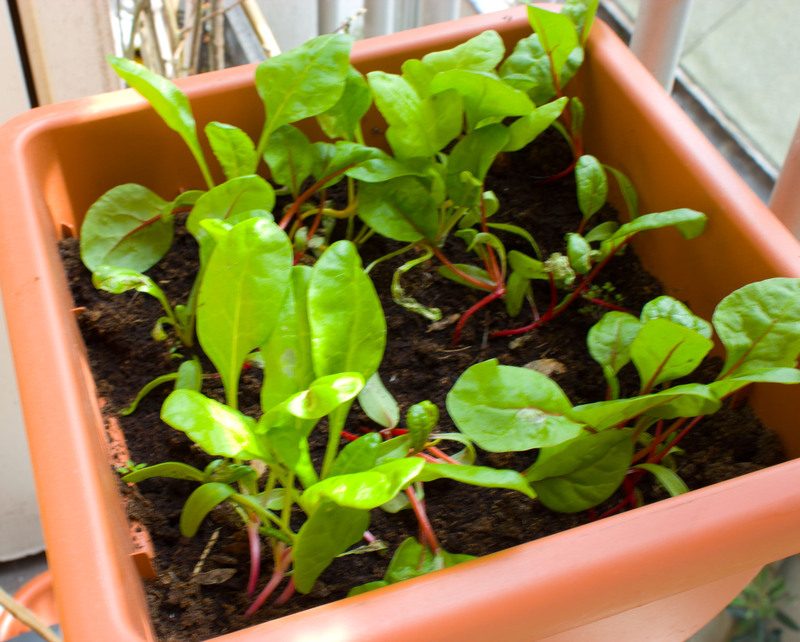 Rainbow chard – a good choice for the balcony. Asian lettuce mix in a hanging compost bag. Maximising space on the balcony is always a challenge and a compromise. Not ALL plants can be grown in pots successfully. I’ve opted for easy growers (lettuces and herbs) in hanging grow bags (which I got at Hema if you’re in Amsterdam) and wall-mounted pots + larger pots for the beets, swiss chard and raspberries. When the tomatoes grow their first true leaves, I will transplant them into a large bucket, which will be modified so that the tomatoes grow upside down. I’ll post more on that soon.